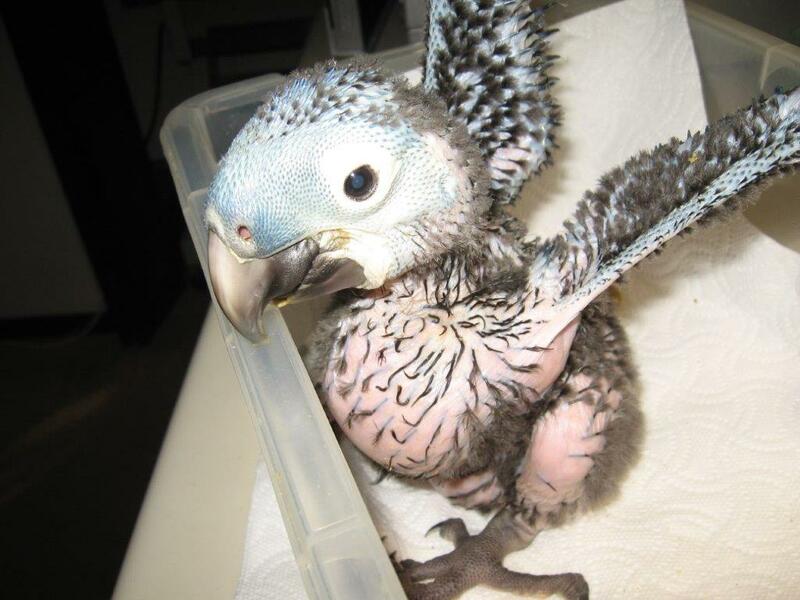 Hyacinth Macaws are relatively difficult to wean as compared to most other birds and the process should be left to only the most experienced Aviculturist. Many variables need to be taken into account when attempting the weaning process. 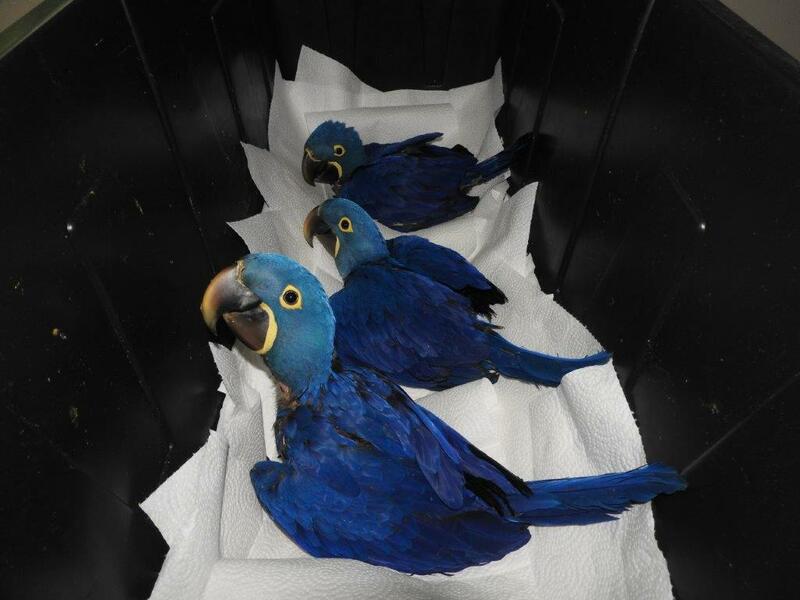 In addition to the nutritional requirements that put Hyacinth Macaws in a league of their own, they are also susceptible to overstretched crops resulting in crop stasis, bacterial infections, fungal infections, leg and/or beak abnormalities, as well as a number of other potential difficulties. Close monitoring of babies throughout the process is mandatory to assure a proper outcome. Over the years, we have tried more formula concoctions than anyone could imagine. We compared just about everything being used by other breeders in order to compile what we consider a decent formula for our babies. 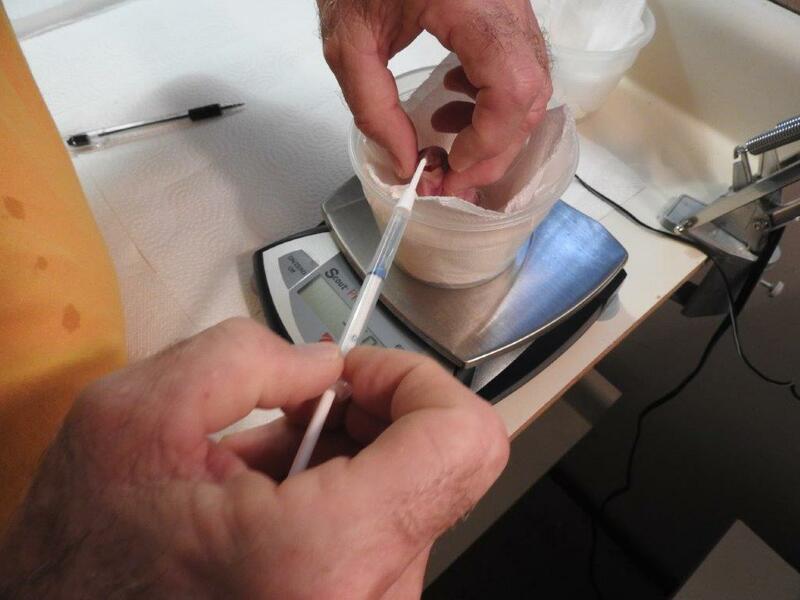 Research and development on nutritional analysis from 3 different labs were utilized to try to determine the chemistry of the most effective formula that we tested. Various additives were tried to bring ratios close to what they seemed to thrive on. The final outcome to date brought us back to basics. Our formula is now comprised of all fresh ingredients in addition to probiotics and vitamin supplements. It is as close to mother nature as we can get. The crops clear, the babies grow to good peak weights, they like the taste, and they wean in 6 to 8 months with proper weights and good plumage. Making the formula is very labor intensive and there are additional ingredients to mix at feeding time, but it is all worth it for healthy, happy babies. The best formula in the world is only as good as the husbandry practices used to implement it. 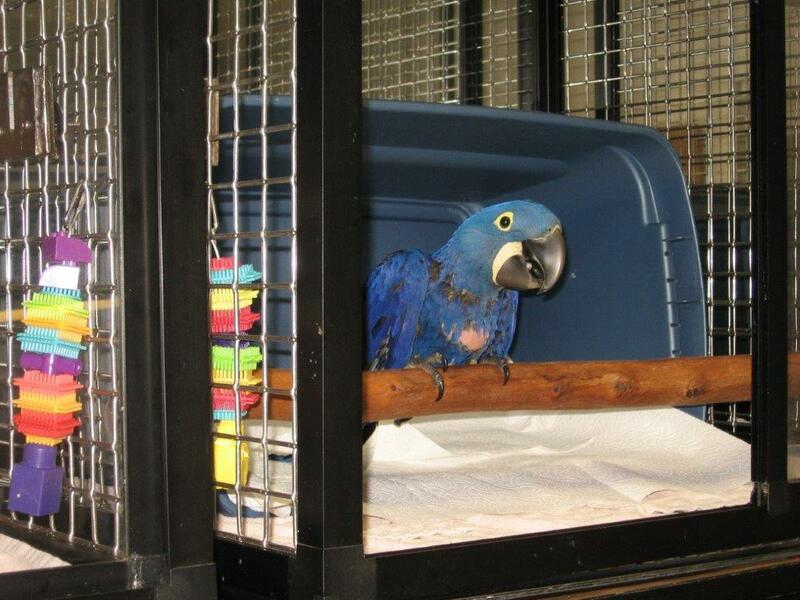 Hyacinth Macaws are more forgiving with less volume and more frequent feedings. When it is necessary to feed day 1 babies, they are fed 18-24 times a day for 3-5 days. We generally are down to 3 feeds at 9-12 weeks. Soft vegetables and mash are offered around peak weight and harder foods are added as the babies mature. Cracked in shell and shelled nuts are offered as the babies become more proficient at eating and are a large part of their diet for the first year. The babies are normally off of the formula at around 6 to 8 months, but are monitored for an additional month or more before any transition is made. In shell nuts gradually replace cracked nuts starting at 8-10 months, until the babies no longer need the nuts cracked. DNA matched pairs are usually introduced to each other at a young age, and brought up in adjoining cages. Frequent, supervised interaction is allowed, including some cage time together, but weaning babies are primarily raised in individual housing to promote better eating habits and reduce the possibility of injury or aspiration. When weaning is near complete, the pairs gradually spend more time together until they eventually share a single cage. Incompatible pairs are put into a group setting and are allowed, over time, to pick another DNA compatible mate of their choosing. Young pairs are allowed to interact with other pairs, in large flight areas, in groups of 4-8 during the daytime. They are put into indoor cages with their mates at night. This works well until the babies start to mature to the point of becoming territorial, at which time they are normally put out into a breeding environment. Beets, Broccoli (they prefer the stems), corn, pole beans, strawberries, kidney beans, pasta, kiwi, lychee nut, rib bones (sterilized), mango, papaya, etc..
A quality avian multivitamin powder (or spray) go on the veggie mix daily. Feed and water bowls must be within easy reach of their favorite perching area. They eat more when the bowls are right in front of them and topped off frequently. Babies have preferences. Try to encourage a wide variety of foods, though nuts are a large part of their diet. New arrivals are normally timid and scared. New toys may frighten them initially, and therefore should be introduced gradually. It may take several weeks or more before the baby begins to settle in. Some initial weight loss is normal (less than 10%). Over time, the baby should gain weight back and eventually surpass its weaning weight. 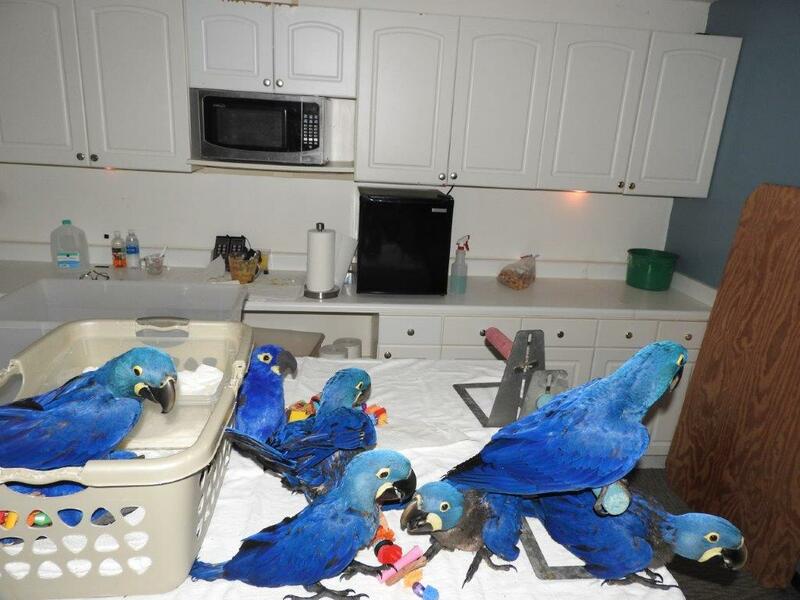 Hyacinth macaws normally gain weight for 5-10 years. New arrivals should be put into a quiet, cozy area. It takes time to gain their trust. Introduce new things gradually as the baby becomes more trusting. Trying to introduce too much, too soon will only set the baby back. The baby needs love and attention, but also needs time to get use to its new environment. Eating is of the utmost importance, and generally is in direct correlation with how well the baby has settled. Too many distractions will normally hinder a smooth transition. Too much love and attention can reduce the nutritional intake and create behavioral problems. Not enough love and attention can be harmful as well. The baby should dictate the pace and the owner should set the parameters. Molding the baby properly at a young age will give years of love and happiness. An over spoiled or unattended baby can lead to a much different result.